Quite new to the scene but I'm very interested in messing around with some scenery creation using AeroScenery and SceneProc, I've managed to get most of it working just fine but now I'm trying to delve into SceneProc for a more custom template based on my area. I've noticed that some tags don't work at all in SceneProc, I'm not sure if anyone else experienced with this or the author has a predefined list of key/values that are accepted. 18:35 UnloadFeatures Information Removing features that match natural="tree_row"
Funnily enough if I modify my map.osm to change the tag key from natural to highway it works fine. 18:36 UnloadFeatures Information Removing features that match highway="tree_row"
I could potentially rename the ones I want, but before I do that I'm unsure if this is intended behavior? The default OSM map comes with natural=tree_row tag/key pair. Other than that much thanks to Nick (AeroScenery), Arno (SceneProc) & Crispy (SceneProc Template). 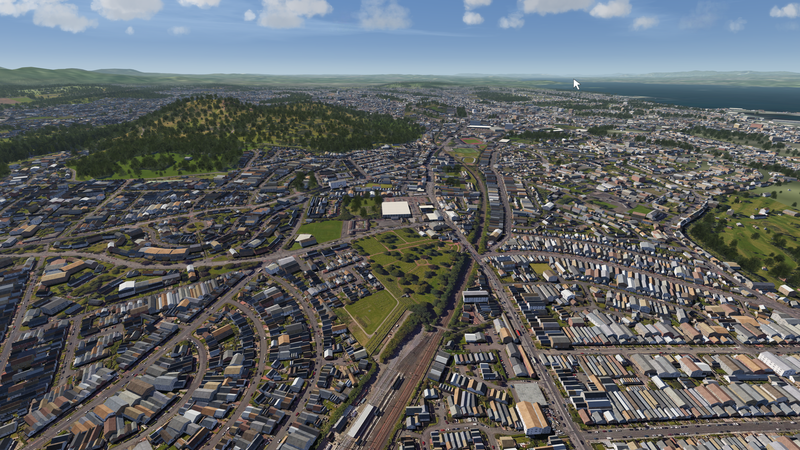 Original Google Maps 3D Aerial - still some way to go, primarily fixing vegetation and additional buildings where there should be vegetation. Edited 3 times, last by nmj ( Dec 23rd 2018 ). Pretty amazing that anyone can do this for almost any city on earth. Good job. Most of the work on OS Cultivation has been done by Spit40. Search for his latest configuration file. - the one that solves the problem of the shimmering buildings. I got ScenProc working directly from the OS data without the need to process in QGIS. Here's the full working workflow. Now edit the file paths on lines 11,12,13,14 & 93 of the following scenproc script, save it as something like "os_data_SD.spc"
# This example for the OS grid square "SD"
# NB: I'm assuming that length is always the longest side !! Edited 2 times, last by Ian C ( Dec 24th 2018 ). I've tried that and it seems like some of the building data is a bit off, I am expecting grass and see a building instead in some places (especially gardens). Going to have a better look to see what is causing it, need to trim the .shp files first as even one square is way too large. The OS grid squares are very large (100x100 km). I like to have my tree separation set to 0.0001 degrees but I don't think ScenProc can cope with the large number of trees generated for some of the squares (over 15 million) - usually if there are a large numbers of buildings too. It crashes. Square TQ (containing London) is particularly problematic. I've had to reduce the tree density in some cases. Fair enough, I'll do some cross-referencing with the OS data to see if it's indeed the right landscape compared to what I see in-game (ignoring photoreal scenery). Seems I've got it working now, PlacePointsInPolygon was missing a INHERITPARENTATTR at the end and I accidentally renamed the .toc file on the output so it wasn't overwriting the old one I had (figured that out after I literally trimmed the entire area down and wondered why everything was still showing up). I just need to play with ReplacePolygonByBuildingRectangles now as some of the more complex polygon shapes are displaying in a weird way (and with different roof types unfortunately, but unsure if I can do anything for that). I think I'm at a point where complex polygons need to be done manually and the only way to have the same roof/building is to remove all the other ones from the building_textures folder as it seems AFS2 just chooses one at random. I also noticed some rotation issues (houses on a hill), they'd either be floating or be in the ground but I don't think much can be done about that unless I design them manually and place them on the map or so. Anyhow I'm happy with the result now - Day Screenshot / Night Screenshot. 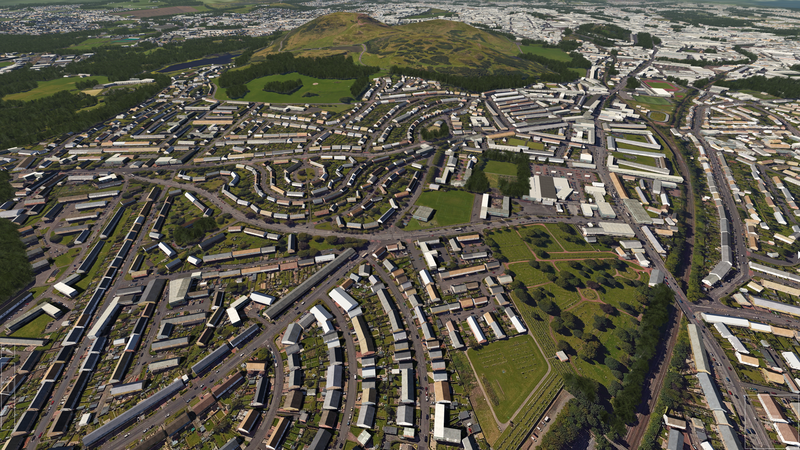 Perhaps the next step is getting the Edinburgh building textures and finally the airport. Edited 3 times, last by nmj ( Dec 24th 2018 ). Anyhow I'm happy with the result now - Day Screenshot / Night Screenshot. This may be a scenProc limitation. Why does the attached OSM file not create a toc-file when running through ScenProc (template_ver6.spc). These are all natural=tree points. The data is from osm and filtered out with osm-filter so only natural=tree is kept in order to keep the file small. The region is north of Berne. Thanks a lot. I will try tomorrow as I am not at my pc right now. natural=tree_row does still not work with scenproc latest dev release. The PlacePointsAlongLine directive is not well suited for tree cultivation. Thanks lenidcamper, works fine now. 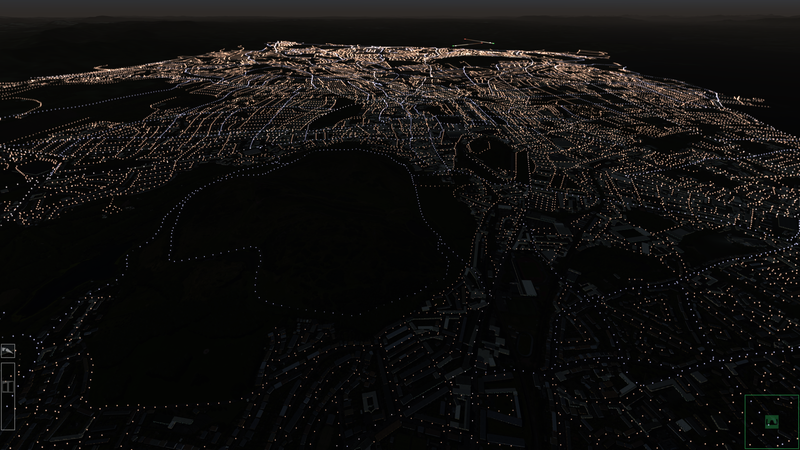 Below is a screenshot from an area with defined tree rows in JOSM (orginal osm data from bbbike). The second picture shows the same region in AFS2 Scenery Editor after the scenproc process. The forests and buildings are not shown as I filter them out for the tests. There are very few tree_rows in osm data but one can draw them yourself (a line defined as tree_row). This is faster than drawing single trees. Can be used for alleys too. And finally the view out of the lovely R22. Edited once, last by TomB ( Jan 30th 2019 ).